CD reviews: "Maria de Buenos Aires: Tango Operita," "China: Time to Listen" and "Global Voices: A Vox Set"
These reviews first appeared in the December 19, 1998 edition of the American Reporter. To appreciate how profoundly the late Astor Piazzolla impacted Argentinean music, you'd have to combine several American musical giants into one. Say Leonard Bernstein for his ability to bring highbrow and popular together. Duke Ellington for elevating what was formerly considered "slum" music to the heights of artistic culture. Hank Williams and B.B. King for breaking down narrow stylistic definitions of their chosen schools and broadening what could be considered "legitimate." Piazzolla did all of the above for the tango. A master of the bandoneon (a cousin of the accordion), Piazzolla was also a composer, arranger and bandleader who helped redefine tango in the 1950s, giving it new life and artistic breath, making it less formal while also bringing it new respect on the world's most prestigious stages. Toward that last result was a tango opera Piazzolla wrote with librettist Horacio Ferrer, "Maria de Buenos Aires." Every bit as modern and edgy as Bernstein's "West Side Story," "Maria" debuted in 1968. This new recording of "Maria" is based on a new arrangement by Leonid Desyatnikov, although Ferrer was involved in this production and even leant his voice to one of the spoken parts. As with all things Piazzolla created, there is a certain Bogart-esque air to "Maria"  there is the feel of low ceilings, cigarette smoke and dark eroticism. The liner notes and lyrics are repeated in four languages: English, Spanish, French and German. The performance itself, naturally enough, is in Spanish. But as with any good opera, you don't need the lyrics to follow the story  the music takes you with it. Over the course of the 1990s, Ellipsis Arts has established itself as one of the best compilers of world and folk music since Thomas Edison invented sound recording. Their box sets and themed collections not only contain the best music on the planet, but they are also always beautifully packaged, wonderfully illustrated and given informative annotation. In their pursuit of music from around the world and their efforts to bring it to the attention of a mass market, they are as important as Folkways Records was in the '60s. 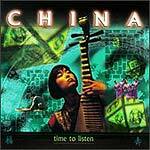 Their recent "China: Time to Listen" is as good as anything Ellipsis Arts has put out. The accompanying booklet has a short overview of Chinese music, a map of China, short bios of the many artists on the three discs, pictures of some of the bands and stunning color photos of the Chinese countryside. The music found here is as stylistically divergent as what you'd find in North America: as different as Mexican ranchero is from Kentucky bluegrass. No surprise there: China is a huge country, both geographically and humanly. If there is a surprise in this collection, it's that so many traditional forms have survived the communist regime's various efforts to eradicate them. Despite the Cultural Revolution and Mao's forced modernization and the basic frowning on anything from the Imperial era, there are hundreds of regional styles  not all of which are presented here, of course. But as cellist Yo-Yo Ma points out in his jacket blurb for this set, China's musical traditions span the most sophisticated chamber music of Beijing and Shanghai to introspective acoustic to wildly danceable folk. Finding an area of world music that Ellipsis Arts hasn't already made into a box set isn't easy, but Music of the World has come up with a gem in "Voices of the World." Subtitled "A Vox Set," this collection goes around the globe to capture all the different ways the human voice is used. Each of the three discs is built around a different theme: Traditional, sacred and contemporary. Each of these themes is then fleshed out with more than a dozen different tracks taken from styles and countries across the globe. On the "Traditional" disc, we travel from Colombia to India to Romania to Laos to New Mexico to Ethiopia to the Central Asia highlands and the now-famous Tuvan throat singing, with a single singer able to bring forth multiple notes at the same time. The "Sacred" set opens with an incredible chant by a Croatian choir, then moves to the Shona style of Zimbabwe before moving on through Sufi mysticism, American gospel from the Deep South and Cuban Santeria, among many others. And as expected, the "Contemporary" collection is all over the map  wonderfully so. From American blues to a capella to modern Brazilian and African pop, it's a quick snapshot of where modern folk singers are coming from. The liner notes give a little information on each artist, most also have photographs, and there are some translations of lyrics. In addition, at the back of the booklet is a list of addresses of all the labels from which this collection was drawn, allowing you to get more music from those artists you fall in love with. As with many collections of this nature, it's not really made for background listening  don't try napping to it, because when you jump from an Ethiopian artist to a Pueblo Indian performance, it can be a bit jarring. Too, not every style is readily accessible to American sensibilities  some of these songs take a couple listens to really appreciate. Of course, the ultimate impression one takes away from a collection with this kind of breadth is just how much great music is being performed but never getting on the radio or MTV.